When I read Jane Street's Champagne Cork Fairy Toadstool article I was immediately very jealous, because obviously the champagne corks are flying over at her house, but after I got over that I was inspired to share my own Fairy Toadstool make. 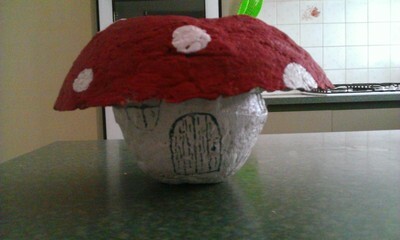 This Papier Mache fairy toadstool is accessible for all ages and, because of the drying time necessary, can be stretched over a few days so it's great for those weeks when the weather is against you. It's also very cheap, who doesn't have flour, water and paper? 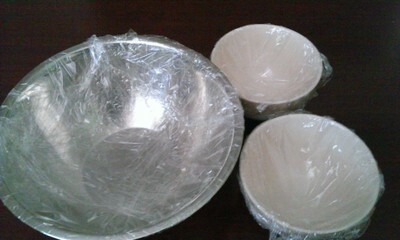 Line your three bowls with cling wrap. This will ensure that the parts of the toadstool don't stick, it's easy to remove when dry and keeps your bowls clean. Tear up the newspaper. It doesn't have to be in strips or even particularly regular. Just rip and chuck the pieces in a bowl or bag. In another bowl, mix 1 part flour to 2 parts water. 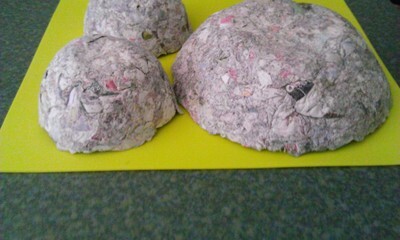 Add your paper pieces and, using your hands, massage the flour glue into the paper. 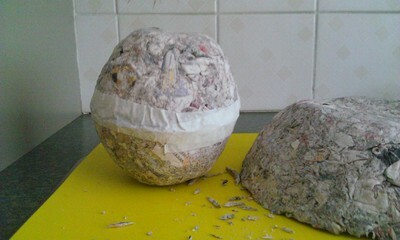 Make sure all the paper is wet and slimy, at this stage you may want to add more water if it's a bit dry. 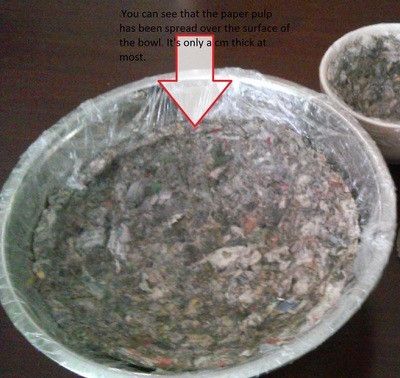 The paper should look soft and pulpy. 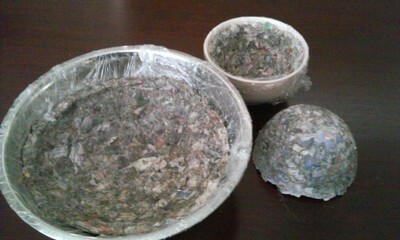 Using your hands, press the paper pulp around the inside of the bowl. It doesn't have to be very thick, just aim for a nice even coverage without gaps. Leave your bowls to dry. When they're touch dry carefully use the cling wrap to ease them out of the bowl. Flip over, discard cling wrap and leave to finish drying. Once your bowls are completely dry they'll look like this. Not really inspiring at this stage, are they? 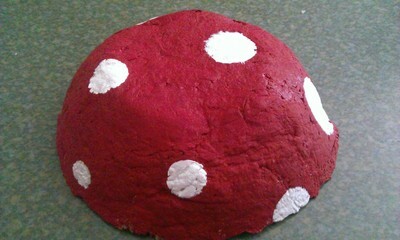 But this is where the toadstool starts to take shape. The small bowls will be used to make the stem. Trim the edges so they're relatively even. Put the two bowls together and use the masking tape to join them along the raw edge. They are not going to match perfectly but the masking tape will cover this. If you do want them to be smooth and perfect you can join them with more paper and flour/water glue. Paint your pieces. 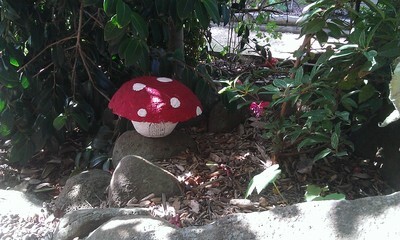 We went with the traditional red and white but fairies (like children) are nothing if not adventurous. They live on the style edge, so go with any colour combination that makes you (and your little fairies) happy. We also added some glitter, because there is nothing that can't be improved with a bit of glitter. Once the paint has dried, paint large spots on the cap and add details to the stem using a black marker. This is your chance to add a door and some windows. And look! We have new neighbours! We didn't seal our toadstool so it won't stand up to wet weather but it does make a lovely fairy house when the sun is shining or inside. Thanks. I'm glad you like it. It's a lot of fun too. Thanks for commenting. I really love this idea, Wendy - so simple and so effective!